Today I'm super excited to bring you a guest post from Becky at Houzz.com. You're probably familiar with Houzz, but if not– it's a treasure trove of beautifully designed interior spaces. Inspiration for miles and miles, that's for sure. It's a fantastic resource for anyone who loves homes and interior design. Jessica has provided some awesome tips below for getting a luxurious look on a budget, which is what we're all about at The Happy Homebodies! Hello everyone! My name is Becky and I'm a contributor at Houzz, a home design site focused on helping design professionals and homeowners manage the remodeling and decorating process. Thanks so much to Jordan for having me! At Houzz we have ideas for a full range of design styles and budgets, but I thought I'd take some high dollar looks for inspiration and dissect how we can attain a similar style without depleting any 401K accounts. Instead of reaching for our wallets, we're going to put in some sweat equity. This means studying why the rooms work, doing some serious treasure hunting at discount stores, garage sales, flea markets and the internet, and getting a workout with some simple sewing and painting. Without further ado, here are three rooms and a few lessons we can learn from them. While this beautifully appointed bedroom is full of high-end items, the champagne, gold and ivory color palette is what makes it so luxe. Find an inspiration room in a color palette you like and study the way the pros have balanced the hues. For instance, almost everything here from the headboard down is ivory. The splashes of gold and champagne draw the eye up. The canopy valance: You can achieve this look with a less expensive fabric like linen or even burlap and still get the wonderful enclosed and centered feel for your bed. Build a simple valance out of 2x4s, get out the sewing machine and start hemming. Two-tone walls. Make sure you pay extra attention to the level and the ruler when marking the stripes. I recommend Frog Tape for painting prep; it's the best painter's tape I've found. Dresser nightstands in matching colors. 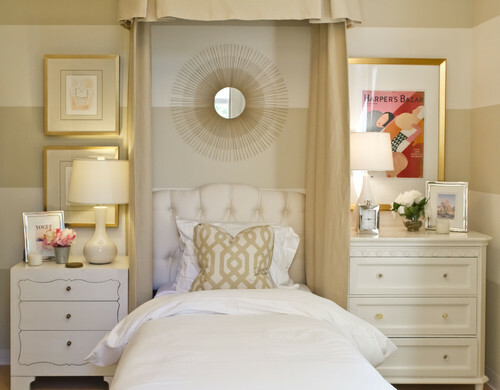 This move is a space-saver that adds big storage to a small bedroom. Attain this look with a fresh coat or two of ivory on existing dressers from your home, garage sale or Craigslist finds. Upholstered headboard: There are plenty of upholstered headboard DIY guides online; a tufted one like this one is trickier, but a plain one will look beautiful and is surprisingly easy to make. Sunburst mirror: Thankfully, these are now pretty easy to find at reasonable prices at places like Homegoods. Really, any round mirror with a pretty frame will do. The secret to looking luxe in the home office is having a place for everything and keeping it organized. There are also a few key investments that will be well worth it for the sake of your household and/or your home business. Invest in a desk: If you don't have an appropriate desk or table that can serve as one, I highly recommend the Parsons Desk from West Elm. They start at $349 and you'll use it forever, whether as a desk, a dining table or a console table. Invest in a comfortable chair that has style. An ugly task chair can ruin an otherwise lovely office. Right now my favorite is the Skruvsta upholstered swivel chair at Ikea. Hide ugly electronics. Drill holes for cords in a console or cabinet to hold your scanner and printer, and keep a drawer just for cords and other computer accessories. Style your shelves. You can paint or wallpaper the back of your shelves to take advantage of this often-overlooked design opportunity. Buy matching boxes (cheap cardboard will do; I've seen some of the most luxe offices decked out in Ikea's white Kassett cardboard boxes and they look great) to keep loose papers and supplies corralled in a coordinated way. Keep your books and magazines nicely arranged, and add in a few of your favorite home accessories. Love your lamp. A table lamp is key for shining light on your work and adding style to your desk. You probably already have one around the house that may simply need a lampshade update. Give it a second look. traditional kitchen design by denver kitchen and bath fixtures Wm Ohs Inc. 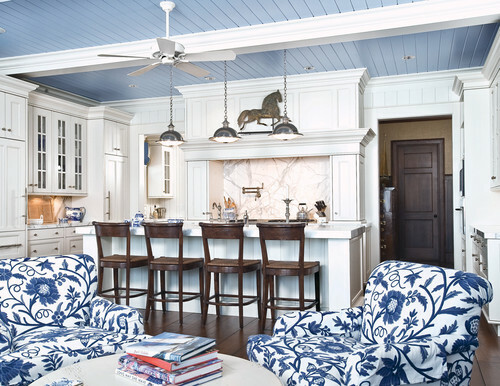 The painted ceiling: This blue ceiling is a clever designer touch. If you have a bit more money in the budget, having planks or beadboard added to the ceiling will add a cottage touch without a full-on renovation mess. If not, paint alone will still make a strong impact. That weathervane horse! Comb flea markets, antique shops, Etsy and eBay for a unique piece like this. Or, if you're artistic, paint a copy of a vintage sign on a board and hang it. Simple wooden counter stools. These contrast beautifully with all of that white. Linens ‘n Things carries some lovely American Heritage Billiards wooden shinto-style stools for just $49.95. Pendant lights over the island. You can find simple metal pendants just about anywhere; the Hampton Bay 1-Light Warehouse Pendant is a steal at $24.88 at Home Depot. I hope this helps you with finding some looks for less. If you have any more ideas and advice, please share in the comments section! Find more interior inspiration from Dallas interior designers and more design professionals at Houzz.